Have you forgotten that we still have British troops in Iraq? I almost had. With the British Press even more, or at least as, biased as America's, the British in Iraq seem to have a low profile. Well, "God bless them. Amen". To be fair, This Fox News report: Baghdad Sweep Targets Sunni Strongholds does say the route is a "suspected" route for weapon smuggling from Iran into Iraq. The Brits blocked the route using shipping containers. "Some congressional Democrats have also expressed concern that the administration was overstating the Iranian connection in the same way that Bush and his aides did in the run-up to the U.S. invasion of Iraq". "...intelligence officials contacted by NEWSWEEK insist that Iranian interference in Iraq appears significant. U.S. intelligence officials say they are aware of staging points—sometimes upgraded in unofficial accounts to "training camps"—in Iran, Syria and Lebanon that are used by insurgents traveling in and out of Iraq. Intelligence agencies believe that supplies, such as the sensors, are shipped from these locations. One U.S. official said that the staging posts do not necessarily stay in the same location for long, which would greatly complicate any efforts by U.S. secret military units or intelligence teams to shut them down". "Iran's Revolutionary Guards have set up a network of secret smuggling routes to ferry men and equipment into Iraq for attacks on coalition troops, according to an exiled opposition group. The smuggling is said to be orchestrated by the guards' elite Quds Force, which has its HQ in the southern Iranian city of Ahwaz. The National Council of Resistance of Iran (NCRI) says commanders are sending a steady stream of agents and bomb-making equipment from a base codenamed "Fajr" into Iraq, where roadside attacks are carried out against coalition troops". There is no way to understand or justify Congess' defense of Iran. Follow the link to Iran Focus for a fascinating map showing "Smuggler's Crossing Points". What is it these people do not get? I'm not advocating for or against war with Iran, but what result comes from denying their broad involvement? The answer is a weakend America and a gaggle of politicians thinking they look and sound wise, strong, senatorial, honorable, and presidential. That's not what it looks like out here in my Red State. Closing Thought: The photo above is captioned as being "...near Contingency Operating Base Speicher, Iraq. This base is named in honor of Naval Commander Scott Speicher, who was shot down over Iraq on the first day of Desert Storm in 1991. Commander Speicher was 33 years old when his F-18 was hit by either an Iraqi surface-to-air missile or an air-to-air missile from an Iraqi fighter jet known to be in the area. Commander Speicher's status is "missing-captured" - somewhere in Iraq. 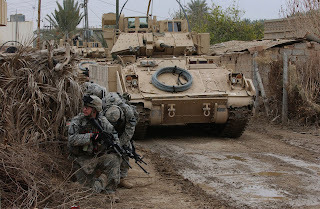 We've had a reason to be in Iraq since the day Saddam's powermongers invaded Kuwait. Commander Speicher is still a valid reason to be there. Trackposted to third world county, stikNstein... has no mercy, Right Truth, The Crazy Rants of Samantha Burns, basil's blog, The World According to Carl, The Right Nation, Pirate's Cove, Cao's Blog, The Bullwinkle Blog, and Conservative Thoughts, Right Pundits, Perri Nelson's Website, Faultline USA and thanks to Linkfest Haven Deluxe. Tracked back by: Faultline USA with Islamists Might be Having a Hate-crime Legislation. The bill is an attempt to create a new vast Federal bureaucracy with unlimited power to overrule state law enforcement by bringing Federal control over state and local policing. This bill may allow the Feds to even act preemptively to 'prevent' crime...". The Florida Masochist with The Knucklehead of the Day Award: Congressman John Murtha. Excerpt:WASHINGTON (Reuters) - U.S. Rep. John Murtha, a leading congressional opponent of the war in Iraq, on Thursday said his plans for placing conditions on how President George W. Bush can spend $93.4 billion in new combat funds would effectively stop an American troop buildup. "They won't be able to continue. They won't be able to do the deployment. They won't have the equipment, they don't have the training and they won't be able to do the work. There's no question in my mind," the Pennsylvania Democrat said.